Sauté or brown vegetables, poultry, beef or fish with Tramontina's tri-ply clad 5-qt covered Braiser. Part of the company's exclusive gourmet collection, a series of premium products engineered and manufactured with the finest design, materials and workmanship, tri-ply clad cookware outperforms similar products within the market and delivers the best quality and value to the cooking professional and enthusiast alike. Providing exceptional performance, distributing heat quickly and evenly without hotspots, this cookware heats from all sides and not just the bottom! combining the impeccable beauty and durability of premium 18/10 stainless steel and designed to withstand repeated usage, even in the most demanding kitchens, this NSF-certified cookware is ideal for home and professional cooks who want the utmost in quality and performance. 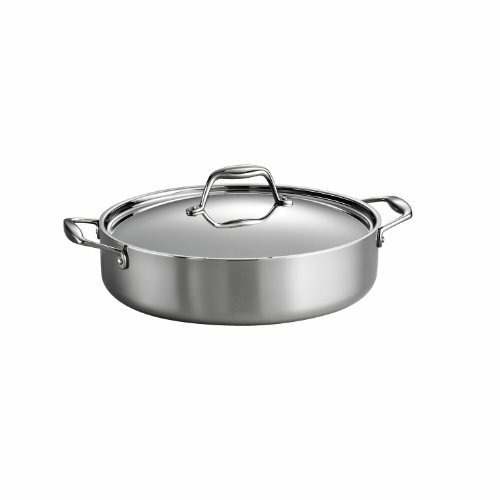 Constructed of a satin finished 18/10 stainless interior cooking surface, an internal layer of pure aluminum for optimum conductivity and a magnetic stainless steel exterior, the full clad process makes this Tramontina cookware a valuable investment which will prove its worth each time it is used. The premium stainless steel construction allows you to use this cookware on any cooktop, including induction, and from there transition beautifully from stovetop, to oven to table. As an added detail, it features riveted, precision cast stainless steel handles and a mirror-polished stainless steel lid. Dishwasher and oven-safe (up to 500 f or 260 c). Made in brazil, assembled and packaged in USA. Lifetime warranty. If you have any questions about this product by Tramontina, contact us by completing and submitting the form below. If you are looking for a specif part number, please include it with your message.